Naples Marco Living wants you to win a great prize. We found online giveaways and sweepstakes from trusted merchants and affiliated websites. Enter to win by following the links below and completing the entry form. No purchase is ever required and your information is never sold or shared. Attention business owners and marketing agents – If you would like to feature your product or service sweepstakes giveaway, contact us by calling 802-221-1498. Enter the current giveaway below. Enter one time per day. Thank you for entering and for liking us on Facebook, following us on Twitter and sharing our photos, pages and tweets. Good Luck! Winner(s) will be notified by email and/or telephone. We will not sell or share your name. Congratulations to Thomas Jeffries-Harrison winner of Golf and Dinner for Four at the fabulous Tiburón Golf Club at the Ritz-Carlton Naples, Florida. 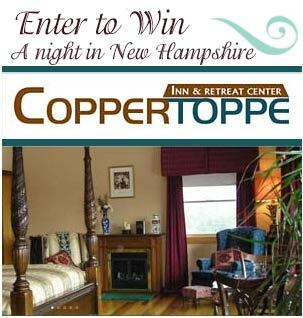 Our latest featured Giveaway is a night in New England at the Coppertoppe Inn & Conference Center. This amazing New Hampshire destination features clean, comfortable accommodations, spectacular views and a hearty New England breakfast. Coppertoppe Inn & Conference Center is pet friendly. Located overlooking Newfound Lake in Bristol, NH. Remember, you can’t win if you don’t enter. To enter this Sweepstakes Giveaway from New England Living Magazine, click here. We will not share your email address and we adhere to a strict “no spam” policy. To feature your business in Naples Marco Living, contact us.